* This review may contain spoilers for the previous book, Shadow Study. To Sum It Up: Yelena and Valek find themselves in danger once again, and this time, not even their combined formidable escape skills may save them. Yelena is still without her magic and the target of assassins. Valek, meanwhile, is no longer certain of his once unwavering loyalty to the Commander of Ixia, and the Commander is no longer sure that he can completely trust Valek. As Ixia and Sitia edge closer to conflict, Yelena, Valek, and their family and friends race to thwart it, but their numerous enemies always seem to be a step ahead of them. 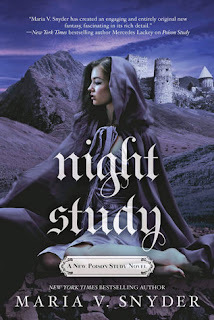 Review: Night Study is the second book in Maria V. Snyder’s new series featuring Yelena, Valek, and all the gang from her original Study series plus characters from her spin-off Glass series. So this is technically the eighth book set in this world that I’ve read, and it’s always a bit of a homecoming to return to it. Yelena and Valek are one of my favorite fictional couples; their slow burning romance way back in Poison Study was just perfect. I can’t begin to quantify how much sentimental value this series holds for me thanks to these two and their close-knit circle of family and friends. In all seriousness, I’d read books about Yelena and Valek in their old age; they’d probably eschew retirement and still be running about Ixia and Sitia trying to save everyone. As much as I love these characters, though, there were a few things about Night Study that I couldn’t quite look the other way on. The first was the book’s pacing; it took me almost two weeks to read this. While there was no shortage of action scenes, which Snyder has always written well and continues to do so, the story itself just felt slow moving in places. Valek goes off on a solo mission that for the most part seems better suited for a standalone short story. Although an interesting twist awaits at the conclusion of his mission, the path to it is somewhat circuitous. While I liked the addition of Valek and Janco’s POVs in the previous novel, Shadow Study, the multiple POVs, which also include Yelena’s brother, Leif, didn’t work quite as well for me this time around. You will never hear me complain about reading from Valek’s perspective. Ever. And that’s not to imply that I’m going to complain about Janco and Leif’s chapters. Maybe it’s because every POV except Yelena’s is written in the third person, but Janco and Leif’s narrative voices don’t always come across as distinct from one another. So on to what was awesome about Night Study. I liked seeing Valek conflicted over his loyalties. He’s been the Commander’s right hand man for years, but Night Study sees their relationship grow increasingly strained. The Commander is wary of Yelena, with her ties to magic and to Sitia, where magic isn’t banned as it is in Ixia, which also drives a wedge between Valek and the Commander. Valek would do anything for Yelena, his heart mate, even defy the Commander. Watching Valek have to make a difficult choice made for a very compelling plotline. We also get the usual witty observations from Janco, a narrow escape or two or three, and a development that’s sure to elate longtime fans of the series. I know I almost melted. While this wasn’t my favorite installment in the chronicles of Yelena, Valek, and co., I’m still very much invested in their next set of adventures. All in All: I found the pace at which Night Study moved on the sluggish side at times and would be OK with fewer POVs, but the swoony Yelena and Valek moments and a big revelation definitely helped balance things out. Sorry to hear pacing issues dampened your enjoyment of this one, although it is always nice to revisit a favorite world or characters, I agree. And it sounds nice that this series has so many installments- lots to enjoy. :) It does sound like a fun series. And the cover got my attention- a nice one. I'm really digging the covers for this new series. This particular book wasn't quite up there with some of the others, but I'd never stop reading about these characters; I'm wayyyy too attached to them, lol! Is this the spin-off or is this the original series? I skipped to the spin-off and totally got lost. I think I have to follow the order, I read somewhere that this is as great as ToG? This is a continuation of the original series, and you definitely need to read the books in order. There are also some short stories featuring the characters that I didn't read, and the events are sometimes referenced in this new series, leaving me a little lost. I think ToG is heavier on the fantasy elements than these books are; it was the romance, of all things, in Poison Study that made me a fan for life, lol.